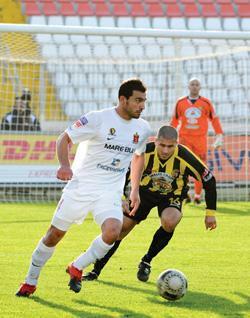 Valletta’s Steve Borg moves clear of Qormi striker Ben Camilleri. Hibernians forward Andrew Cohen runs past Emiliano Lattes, of Birkirkara, during Saturday’s Premier League clash at the National Stadium. The Stripes won the match 3-1 to leave the troubled Paolites second from bottom in the table. 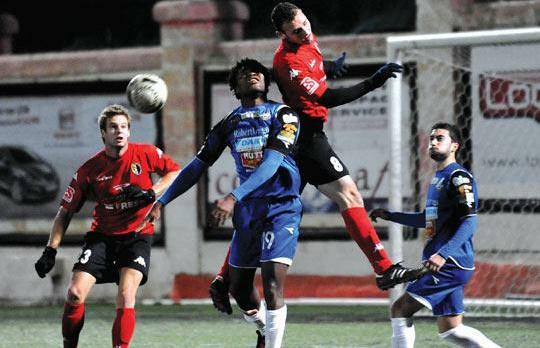 Roderick Fenech, of Ħamrun, beats Sliema’s Obinna Obiefule in the air. 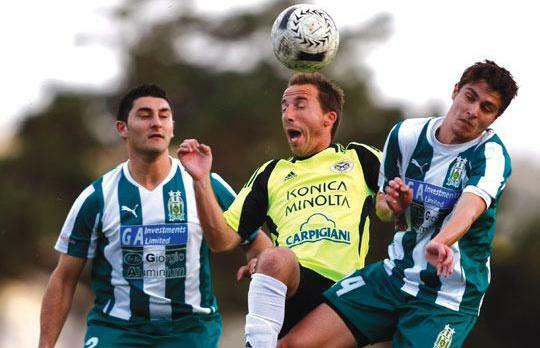 Marsaxlokk’s Peter Pullicino (centre) gets first to the ball against Floriana. These are indeed happy times for Tarxien Rainbows and their fans. After causing a stir last season by sealing their place in the Championship Pool with some matches to spare, the Rainbows look well-placed to emulate and possibly improve on their top-five finish as they are second in the table on 23 points, seven behind leaders Valletta and three above reigning champions Birkirkara. Tarxien’s upward trajectory has taken many by surprise in light of their perennial struggles to establish themselves in the top division but their steady progress certainly bodes well for their long-term future. The financial backing of Tony Cassar, Tarxien’s unassuming president, has been central to the team’s rise but investing solely in players is sometimes not enough to achieve the desired results. Teams need a strong-minded and dedicated leader to prosper and Tarxien certainly have that in Noel Coleiro. Now in his fourth season at the helm of the Rainbows, Coleiro has earned a reputation as one of the brightest Maltese coaches after transforming Tarxien from Division One promotion hopefuls to Premier League high-flyers. On Sunday, Tarxien all but reached Coleiro’s pre-set target as their 1-0 win over Vittoriosa Stars virtually assured them of a place in the Championship Pool. Tarxien needed a late goal from Brazilian defender Everton to down Vittoriosa’s stern challenge but the Rainbows were worth their win as they created a hatful of chances only to be denied time and again by goalkeeper Simon Agius. “We scored in the last 10 minutes but we were the better team,” Coleiro said. “Vittoriosa set out to defend but we dominated the game. After Valletta, who are still unbeaten after 12 matches, Tarxien have been the most consistent side as they have now gone seven league games without losing. Their positive run has led to suggestions that Tarxien could prevent Valletta from walking away with the league title but Coleiro is not looking too far ahead. 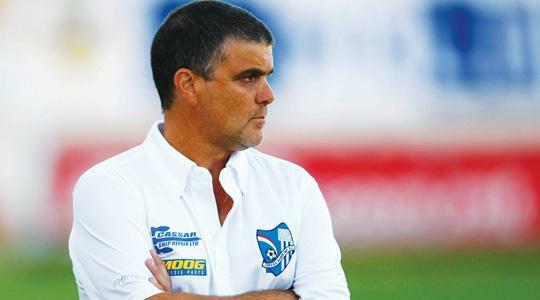 “My philosophy is that we must first secure our place in the Championship Pool,” Coleiro said. “We have agreed with the players that, once we attain our top-six objective, we will hold a meeting to discuss a new, realistic target for the team. We may set our sights on a top-four finish to improve on last year’s fifth position or we could aim for qualification to Europe but we will earmark a new target together. Tarxien’s drive to increase the depth of their squad is a key factor to their consistency this season, according to Coleiro. “In the summer, we acquired four foreigners and also some local players,” Coleiro said. “The experience of another year in the Premier League helped us a lot while the addition of new players increased our resources. “The media often focus on our foreigners but seeing the likes of Luke Vella Critien, Manuel Caruana, the team captain, Steve Sadowski and Lee Galea making a significant contribution to Tarxien’s progress gives me a nice feeling because these players are not big names in Maltese football. “Our biggest asset is that we have a stronger squad (compared to last season). Against Vittoriosa, I had Mark Tanti, Ryan Mintoff, Ryan Grech, goalkeeper Anthony Curmi, Julian Vella and Sergio Hili on the bench. Tarxien will train as usual over the next four days but the players will be given a week off after Christmas to gain a much-needed breather. Sergio has already left for Brazil as he has not seen his family since signing for Tarxien in the close season. While Everton and the returning Daniel Mariano Bueno had already proved their worth here, Sergio, Cristiano and Ricardo Costa were unknown quantities when they joined the Rainbows in the summer. They took a while to find their feet but Coleiro refused to jump to conclusions, insisting that new foreign players need time to adapt to Maltese football. He has certainly been proved right as Tarxien’s Brazilians import have been earning the plaudits for their influential showings. “Foreign players, especially those coming from a far country like Brazil, need time to settle,” Coleiro said. “They go from a professional team to a semi-professional one. There are a lot of things that can affect them psychologically in the beginning. They must get used to new team-mates and most of the time, they are away from their families in the opening weeks and months. “I assess my foreign players after seven to eight competitive games. In the first three outings, they didn’t fare that well but they’ve improved significantly since then. Although Coleiro is happy with his squad, he is keen to bring in a couple of reinforcements during the January transfer window. Coleiro is not expected to change any of his foreigners but he was also quick to voice his admiration for the Maltese players. Coleiro, who had a successful five-year stint with San Ġwann before taking charge of Tarxien at the start of season 2007/08, is one of eight Maltese coaches at the helm of Premier League teams. His towering impact has not only vindicated Tarxien’s faith but further enhanced the image of Maltese coaches. Not that Coleiro sees any difference between local and foreign coaches. “There is no distinction between Maltese and foreign coaches as far as I’m concerned,” Coleiro said. “The Maltese coaches working in the Premier League today are all intelligent persons who have successfully completed UEFA courses. Leaders Valletta maintained their imperious march at the top of the Premier League standings last weekend after thrashing Qormi 4-0. Surprise package Tarxien Rainbows gained sole possession of the runners-up spot with a narrow 1-0 win over bottom-placed Vittoriosa Stars. The Citizens were in a class of their own against Qormi who had a couple of key players missing and were unable to match their opponents in graft, speed and co-ordination. Terrence Scerri scored twice and Gilbert Agius added another with a curling free-kick as Valletta made sure of their ninth victory by the end of the first half. Midfielder Kevin Sammut rounded the scoring early in the second half. Tarxien were made to fight hard for the points as Vittoriosa, with goalkeeper Simon Agius in terrific form, held tight in their bid to take something from the match and move off bottom place. Agius produced a man-of-the-match performance but he was beaten by Everton’s winner 11 minutes from time as the Rainbows moved three points clear of Birkirkara in second place. The Stripes struck three goals in the opening half against a hapless Hibernians team to extend their positive run to seven matches and continue with their recovery after a rather shaky start to the campaign. Two goals from Paul Fenech and another from Emiliano Lattes did the trick for Birkirkara. Mark Miller’s Hibs tried hard to get back into the game after the break but they only had one goal, scored by Steve Pisani, to show for their efforts. Two teams making inroads in their effort to finish in the top six at the end of the second round – Ħamrun Spartans and Floriana – did well to boost their aspirations at the weekend. The Spartans relied on Gaetan Spiteri (2) and Massimo Grima for goals in a 3-2 win over beleaguered Sliema Wanderers. The Blues are still languishing in the wrong half of the standings as the efforts from Jean Pierre Mifsud Triganza and Obinna Obiefule proved futile yet again. More was expected from Marsaxlokk in their match against Floriana at the Hibs Stadium on Sunday. However, the Greens looked the more composed team and returned home with the points in their bags thanks to an Ivan Woods brace and another goal from Christian Caruana late on. The Greens have now opened a six-point lead over fourth-bottom Qormi who are two points behind the fifth-placed Marsaxlokk as the scramble for positions is likely to intensify after the Christmas break. Birkirkara: Lattes 5; Vella 3, Galea 3 (1 pen), Fenech 3; Cilia 2, Tabone 2 (1 pen); Vukanac, Borg. Floriana: Woods 4 (1 pen. ), Mecerod 2, Caruana 2; Dzhorov, Darmanin, Agius. Ħamrun Spartans: Spiteri 7; Pereira 4, Grima 4; Shields 3; Anizoba 2, Mangion, Fenech pen. Red cards: Hrubsa (vs Floriana, vs Valletta), Bonnici (vs Floriana). Hibernians: McManus 4; Cohen 3 (1 pen); Caruana, Clarke, Herrera, Farrugia, Pearson, Pisani. Red card: Pulis (vs Ħamrun Spartans). Marsaxlokk: Effiong 7; Templeman 2, Guereiro 2; Alcorse pen, Kokavessis, Deanov. Red cards: Alcorse (vs Valletta), Mamo (vs Floriana). Qormi: Mallia 3,Frendo 3; Bjedov, J. Farrugia, Bello Osagie, Chetcuti, Camilleri. Red cards: Bondin (vs Ħamrun Spartans), Hojung (vs Vittoriosa Stars). Sliema Wanderers: Mifsud Triganza 4, Obiefule 4; Lima 2; Scerri. Red cards: Mintoff (vs Birkirkara), B. Muscat (vs Vittoriosa). Tarxien Rainbows: Bueno 5; Sergio 4, Ricardo Costa 4; Cristiano 3 (1 pen), Caruana, Everton. Own goal: Pearson (vs Hibernians). Valletta: Scerri 10 (2 pens); Denni 5 (1 pen), Sammut 5; Falzon 2, Pace 2, G. Agius 2; Zammit, E. Agius, Temile, Borg. Red cards: Ramon (vs Floriana), Falzon (vs Ħamrun). Vittoriosa Stars: Ewurum 4; Santos Silva 2, Edison 2; Micallef. Own goal: Gauci (vs Hibernians). Red cards: Campagnoli (vs Valletta), Edison (vs Birkirkara), Mifsud (vs Valletta). Friday, Jan. 7: (Tedesco Stadium) 7.30 p.m. Floriana vs Ħamrun Spartans. 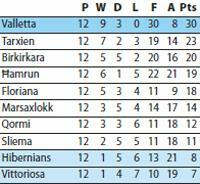 Saturday, Jan. 8: (National Stadium) 2 p.m. Hibernians vs Marsaxlokk; 4 p.m. Valletta vs Birkirkara. Sunday, Jan. 9: (Hibs Stadium) 2 p.m. Sliema Wanderers vs Vittoriosa Stars; 4 p.m. Tarxien Rainbows vs Qormi.